The world's biggest and most advanced fusion device of the stellarator type has successfully completed its first experimental campaign. At Wendelstein 7-X in Germany, the original copper-chrome-zirconium heat-extraction plates will be clad with graphite tiles in the coming weeks to protect the vessel walls for the next campaign of higher-power plasmas. Located at the Max Planck Institute for Plasma Physics (IPP) in Greifswald, Germany, Wendelstein 7-X has produced approximately 2,200 plasmas since the start of operations last December, first from helium and then from hydrogen gas. "We are more than satisfied with the results of the first experimental campaign," reports project head Thomas Klinger. From first pulses of half a second, pulse lengths of six seconds were ultimately achieved. The plasmas with the highest temperatures were produced by microwave heating of four megawatts lasting one second. At mean plasma densities, the physicists were able to measure temperatures of 100 million °C for the plasma electrons, and 10 million °C for the ions. "This greatly exceeded what our rather cautious predictions had led us to believe." Moreover, the structure and confinement properties of the novel magnetic field proved in the first tests to be as good as expected. Modifications in the plasma vessel are now proceeding to make the device fit for higher heating powers and longer pulses. 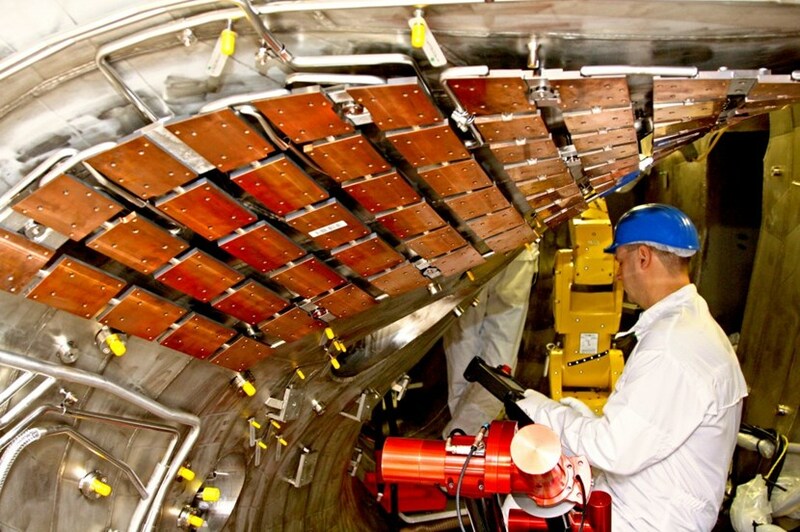 The plasma vessel has been re-opened in order to mount 6,000 carbon tiles to protect the vessel walls and insert the divertor in order to be fit for high-power plasmas with heating powers of up to eight megawatts lasting ten seconds. See the original story on the IPP website.